I’d never heard of Happy Traum, but the events at the Tompkins Corners Cultural Center (TCCC) (see also: Tompkins Corners Cultural Center; Latino music festival at Tompkins Corners Cultural Center; David Amram Quintet at Tompkins Corners Cultural Center) are usually worth going do so when my wife mentioned that this was taking place we decided to go. She also alerted our friends George and Gloria, which turned out to be a wise move as George has a particular connection with Happy Traum and had not known that the concert was taking place. George is a real folk afficiando (he’s particularly fond of Bob Dylan) and has, as far as I can tell, a virtually encyclopedic knowledge of folk, blues and possibly other musical genres. Mr. Traum plays a particularly important role in George’s life as the featured performer in the first folk concert he attended. So George was excited to go to the concert and told us that he would pick us up at 7:00pm for the 7:30 start. They arrived early and we chatted for a bit while my wife finished getting ready. Consequently, when we left I forgot to take a camera so we only had access to our iphones. My old iphone 5s didn’t do a great job in the gloom of the former church. My wife’s iphone 6 did better, but not as well as I could have done with one of my other cameras. Still it’s better than having no record at all. I very much enjoyed the concert. The first part was Mr. Traum playing the guitar and singing. This was followed by a short intermission and then an entertaining audio-visual presentation by Mr. Traum on the Folk Music Revival of the 1950s and 1960s of which he was very much a part. I was surprised to learn that Mr. Traum, as a member of the New World Singers, was involved in the first recordings of Blowin’ in the Wind, and Don’t Think Twice It’s Alright. Bob Dylan also performed in the band, but because he was under contract to another label could not use his real name. So he appeared on these recordings as Blind Boy Grunt. 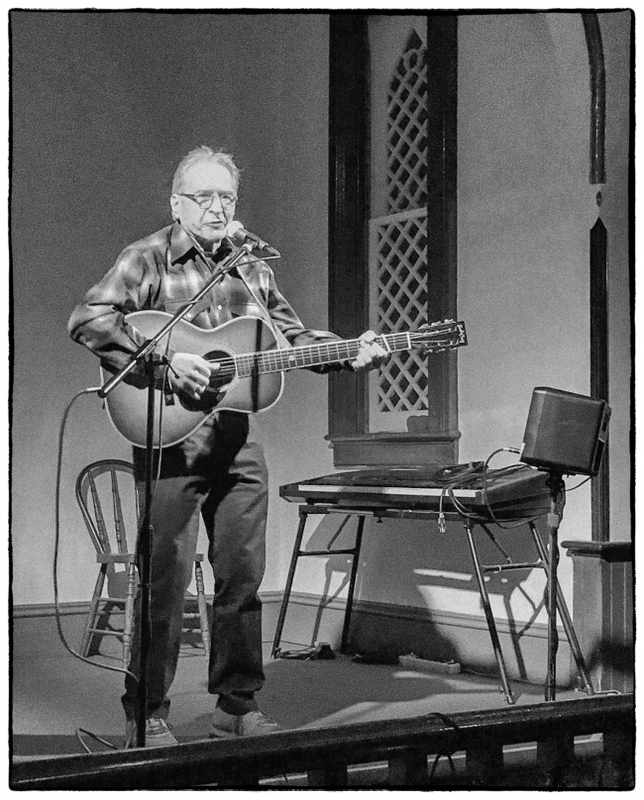 John Cohen (see John Cohen at L. Parker Stephenson Photographs in New York), also an important figure in the Folk Music Revival was also at the concert (he lives close by and has been heavily involved in the creation and ongoing work of the TCCC). He introduced Mr. Traum and added the occasional insight during the presentation. Here Mr. Traum sings a song involving ‘robber baron’ Jay Gould, whose mausoleum (see: Woodlawn Cemetery – Dr. Dunlop, his parrot and magic boots) we had recently bumped into in Woodlawn Cemetery in the Bronx and whose house (see: House of Dark Shadows) we had often visited in Tarrytown, NY. This entry was posted in Black & White, People, Places. Bookmark the permalink.